One of the graphical changes in Windows Vista is the fact that, if Aero is enabled, the titlebars and borders of each window are translucent. By default, all your windows will have a light blue color. However, it can be changed at any time so that it fits your taste. In this article I will show you how to do it. The first step is to right-click on your desktop and click on 'Personalize'. You can access the Personalization menu this way on Windows Vista, 7, 8 and in Windows 10. Rest of the instructions are for Windows Vista. If you need help with a certain setting in other Windows versions, feel free to leave your questions in our comments section at the end of the article. Then click on 'Window Color and Appearance'. In this window you can change the color of the windows, start menu and taskbar. If you don't like the available options, you can click on 'Show color mixer' to create your custom colors. A small roll-out menu will reveal three options: hue, saturation and brightness. If you move the sliders right or left you will see the color of the windows and taskbar changing. However there is a slight 'problem' that might annoy you: unless you pick out a very bright color, the color of the taskbar and all maximized windows will continue to have a shade of black. Unless you change the theme of your desktop, that shade of black will always remain. After you have decided the color that you prefer, click on the OK button and the new color will be applied. POSSIBLE PROBLEM: Many users reported that, after they click on 'Window Color and Appearance', they see a window like the one below. If this applies to you, then choose Windows Aero in the Color scheme list, click on OK and restart the procedure described above. You will now find all the menus and options described above. NOTE: Windows Aero is not included in Windows Vista Home Basic. If you have this version, you won't be able to enable Aero and use it. You must upgrade to at least Windows Vista Home Premium. I followed your steps up to the "Window Color and Appearance," but once that window opened, it didn't have any of the features you listed. I looked nothing like your screen shots. Do you know why this would be? Help? Found the solution to this prob! You shud now be able to find the features like colour mixer and the different available colours! Hope zis will b of help! Thank very much for your help~! That was the solution, my computer is showing the same options at the tutorial now. I did what you said, but it doesn't add any new options. hey i did the thing u said to change it to standard and i applied a clicked ok but for some reason when i pull it up again im still on the vista basic :/ can you tell me why? The "window colour and appearance" window used to be as the one shown on the screenshot! But now..it's no longer ze same.. Am havin same problem as Mitsukai!! Don't know wat i did for this to happen! Any idea wat is ze prob! Thx..
How do you adjust the transparency of the start menu/windows etc (not turn it on or off). When I click on window color and appearance it asks me what program I want to open the file control.exe with. I tried clicking on everything but it doesn't work. I recently had a virus on my computer that I had fixed. Is there anyway of changing the appearance??? I followed the steps and the windows are changing color but the taskbar and start menu are not. Any advice? i have no option for windows vista standard or aero, and there is no scroll bar on mine. It seems like i used to have aero and all that but its gone now. What version of Windows Vista do you have? If you have Windows Vista Home Basic, then you cannot have Aero in the list of options and the above tutorials doesn't apply to you. 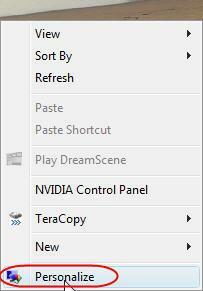 I have just re-installed a fresh of Vista Premium, like previously i want to chage the colours of my windows. This time round it opens the oringinal window like whats in xp with the list allthough, reading all your solutions it does not seem to have what your all saying to do, i do not have the "AERO" of the Vista "STANDERD" as some of you are suggesting, its Set to Vista "BASIC" now as i only have that and "windows STANDERD" "windows CLassic" and 4 "high contrast things." Please could anyone one help me? its just a small but annoying problem now. Hi the tutorial is very helpful, but when im at the appearence setting there is no window aero. I just reinstalled winodws vista home basic, and this seems to be the only problom. Before reinstalling I was able to change the color scheme, and now i cant. Any ideas that could help me out? If you have Windows Vista Home Basic you will never see Aero as one of the possible options. That's because Aero was taken out of this version of Vista. You need at least Windows Vista Home Premium for Aero. I did the steps, and it still doesnt help. When I switch it to Windows Aero It does, but then when I click Windows Colors and Appearance again it says it's on Windows Vista Basic. And I just want to get to the color mixer!! No Vista Standard in list. There is no option to apply Windows Vista Standart, only Windows vista basic and Windows standard. Windows Standard looks like the windows on windows ME. I have Vista Home Premium, but would my Vid card mess with it? I have an ATI Radion 9200 chipset and I am wondering if that is the cause. Well, with mines, I 'USED' to have Windows Aero. Yeah there used to be Windows Aero before Windows Vista Basic but now it's gone. I wander if you can help me. Windows Aero - got it back! I had the Desktop Windows Manager Session Manager disabled, once i re-enabled it, Windows Aero re-appeared. I have a video game that isn't compatible with some of the vista color schemes, and it changes it to the second menu shown when I go to change it back after playing. I tried this and realized it was set to automatic, so I clicked reset device, and then set the theme to aero in the second window shown and it got back to normal for me. It was already set to automatic, but I hit "Restart" to the left and it appeared after I opened it. I am still oblivious as to how this changed in the first place. if your thing doesn't say windows areo...go to the windows standard!!! hi! i'm the same one who asked for help regarding aero.. i forgot to tell you that i changed my window color once before but it changed back.. what happened? thanks..
omfgosh i closed everthing and then i restarted and then i got transparency and then i went 2 apperance settings and i get colors yay!!!! thank u soooooooooooooooo much! I had the same problem as Mitsukai, and the listed solution of selecting "Windows Vista Standard" and clicking ok was not an option for me because it was not listed within that list! So my first instinct was to RESTART my computer, and when i tried again i got the normal window with my choice of the colors, as it should be! so try that and hopefully it works for you too!! I know this will sound absurd, but I have Windows Vista Home Basic and I used to have the Aero colors, even though I never had the Aero option on my color scheme. I say used to because, as of yesterday, it is gone. I can't find it anymore. I used to have on Window Color and Appearance the options like Graphite, Blue, Teal, etc...but now I only have the same choices of Basic. Funnier, though, is that a long time ago I had the same problem and I started messing around in Windows an I got it back...but now it seems that it's really gone. I had color changes after an update install from windows and do not have the options listed. when i go to control panel -> appearance and customization -> personalization, instead of the window colour and appearance settings, the display settings window pops up instead. I cant change the windows colour settings or select windows aero because the wrong window pops up! it helped me a lot!!!!!!!!!!!!!!!!!!!!!!!!!!! i right-clicked on my desktop and clicked on 'personalize'. then i clicked on 'windows color and apperence'. then i changed the color scheme to 'windows aero' and clicked 'ok' but it didnt work. i didnt find 'windows vista standered' in the color scheme either. does anyone know how to fix this? I used to be able to change the appearance like in the first option, but it changed today to the second one, and i don't have aero, can it be changed back, why does this happen? I was having the problem where the window popped up allowing me to change the schemes. Thanks for telling me to change it to Windows Aero. Great, simple, perfect instructions. HELP! my vista used to be like the first half of the tutorial, i follow this tutorial and tried to change it, but the windows aero option is gone. I can't find it. i've upgrade my xp to windows 7.
but sometimes, i can't change my window color and appearance....instead, the windows setting and appearance box that come up. also, the minimise taskbar no longer have the small preview..just like the xp style. the computer said " they have changed the theme......"
i can't follow your solutions above bout the "windows aero" or etc..as there is no such thing like that in mine. do u have the solution guys ????? Hi, does anyone know how you can create a start up script that default enables one of the customized colors of Vista? Thanks for all the advice. I used to be able to change the window colour settings (shown in tutorial) but it was mysteriously gone. and the problem in the second part of the tutorial appeared. so upset when the problem occured, lost all my colours =( dunno what i did to change that?? after following the advice by selecting windows vista standard (many many times). and when i go back to personalization>window colour and appearance. problem gone and i can change my colour again - teal, pink, frost etc. My friend messed up the colours of the windows, taskbar and start menu, and when I changed the colour of the windows back, the taskbar and start menu colours stayed very dark. This didn't happen when I changed the colours when I first got the computer. Help! I recently downloaded SP1 for my computer. Before this, it used to show the screenshots above. Now it shows the screenshots with the Appearance Settings menu. Does anybody know if SP2 works like this? Hi, this was very helpfull and yall run a good site, but it is still not working for me. I used to be able to change the color just by right clicking on the screen, clicking personalize, then windows color and appearence. The list of colors would come up, as in the picture. But then once, after shutting down, it turned a light blue, and now that windows box opens up with the following choices: Windows Vista Basic (which is what it is on now), Windows Standard, Windows Classic, High Contrast White, High Contrast Black, and then High Contrast 1 and 2. There is no Windows Aero. BUT, I used to be able to do this, so this box is a new thing. Can I re-install something? Or update? If so, could you give me a website or a link? I have the Windows Vista Home Basic and the way you showed in the tutorial is exactly the same on my computer when you create a new user name, and on my profile it used to work to, but now it go's straight to the classic themes like you show in the pic. I don't get, it's really confusing can you help me out please?!? My laptop has randomly set to Windows Classic. Anyone know how to fix this? i have finally figured it out. if you have vista then open my documents and type in the search box: .theme and it will come up with a file called THEMES and a thingy called aero backup click on that and it will be windows aero again. the options are different on my comp, please help!!!!! I tried changing it back to windows aero so I can change it back to the color scheme I had. But, it's not there! I have windows home premium, but all I see in the Appearance settings is Windows vista basic.... I know there used to be windows aero , but not anymore! Help? Oh and I do have Windows Vista Home Premium but I don't understand why I don't see anymore options. when i change the desktop screen and place a picutre on the desktop, it changes but only for a little while and then after that the screen changes color back to black, i dont know what is the problem, it would be helpful if you would direct me . i cant change my color schme, i tried clicking "change the color scheme" but there is no window that is popping out. :( should i download color scheme? i am using windows 7 home premium. I have always been able to control the colour of my task bar, theme and so forth. However just a few days ago, my taskbar automatically turned black. The theme stayed transparent - as i want it to be - but the colour of my task bar cannot be changed, through personalisation/themes/colour etc..
What can i do to fix this problem. Wow, the solution was so simple! It was driving me crazy for weeks! Thanks a bunch! Mine isn't like either examples. It used to be like the new one (first one) and I want it back like that. I changed it to classic, and now, when I click on "color and appearance", it only lists Windows Standard, Windows Classic, Hich Contrast White, High Contrast Black, High Contrast #2, and High Contrast #1 but no Aero setting. I know I have the setting 'cause that's what it used to be, but it won't show up. Does anyone know how to fix this? *item: 3D Objects, Active Title Bar, Active Window Border etc. I can't change my window color. Pls help, thanks. Windows Vista Basic Color Scheme - no option to change colors? 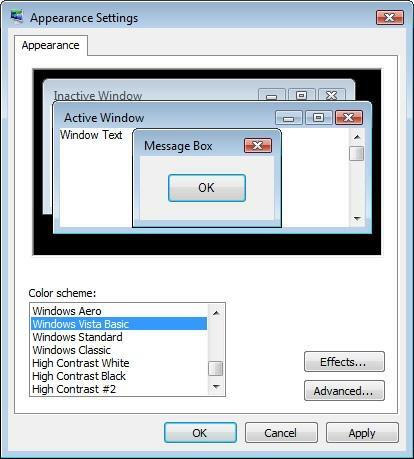 If I open the appearance settings I have the option of selecting a color scheme, such as what I use which is Windows Vista Basic color scheme. However there appears to be no way to change the colors of the scheme. I would like to change from the default bluish hues to something different. If I hit the advanced button it does have a clunky menu for changing the color of windows and fonts and such. Unfortunately it does not appear to work. I changed the colors but they do not apply anyway and I am still stuck with blue. What is going on? Its no longer easy to change window colors? This doesn't make any sense to me. Right click on desktop and choose "Personalize"
On the Personalization window that pops up I choose "Window Color and Appearance"
A box pops up showing that I am currently using the Windows Vista Basic color scheme and on the top shows the look of that scheme with the current color. Change the "Color Scheme" from the choice box. Other choices are like Windows Aero, Windows Standard, Windows Classic etc. (My only reasonable choice is to stick with Windows Vista Basic, What I want to do is change the colors being used by windows vista basic) There is no custom or new option or anything. Advanced button: I choose the advanced button and a new box pops up where it appears that I can choose the color of the window areas. 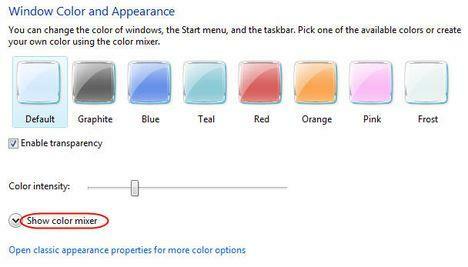 Unfortunately this does not change the colors I see when using windows. I changed the colors to orange to test it out. Nothing happened. However I did notice that once a square shaped rather than smooth cornered error message popped up for something that happened. And that box did in fact appear with the orange color I selected. How made it??? Please!!! Somebody Help!! !